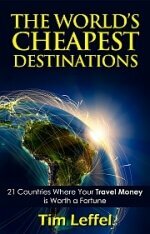 As the author of a book on the cheapest places to travel in the world, I know we have a tendency to generalize about a whole country in terms of prices. Obviously when you get somewhere though, a beach where all the rich people go is going to cost more than a beach where it’s just a bunch of surfers sleeping in hammocks. This is also true in the USA, where even within Florida the differences can be dramatic. There’s no shortage of “best beaches” silly top-10 lists that are short on justification—besides getting you to click through a slideshow filled with ads. There are indexes published every year that rate the affordability of various beaches, but they’re usually fundamentally flawed in some way. One that just came out this month, for instance, rated them by “the average cost of sunscreen, a bottle of water, a beer, ice cream and lunch.” Seriously? What if you (like any smart person) bought your sunscreen elsewhere? What if you don’t eat ice cream or think bottled water is a scourge? I think it’s a lot more useful to focus on the biggest expenses instead: hotel costs, meals, entertainment, and parking. Keep in mind though that accessibility is always going to play the biggest role. For many people the best beach is the closest beach. That means they don’t have to fly with an unpleasant airline and they can bring all their luggage. Or they can do a day trip with a packed cooler. A recent report from Trivago found that 7 out of 10 hotel searches by Texans were for…places in Texas. If you’re feeling more mobile though, here are the bargains in the USA. I’ve used research for what people are actually paying for hotels via Trivago, plus pricing info on other factors from Numbeo and official local sources. With an average hotel cost that comes out to $122 double per night throughout the year and peaks at $157 (in March), Daytona Beach just may be the best value on the Atlantic coast. The ocean water temperature here climbs above 70°F in late March and then doesn’t drop below that level again until November. You can still get a $3 pint or a sub-$10 cocktail here and parking is $10 a day on the beach. Duck your sunburned body into the cool air conditioning of the eclectic Daytona Beach Museum of Arts and Sciences for $12.95. South of Tampa Bay, this laid-back beach town feels more like the Florida of old than places with a wall of high-rises like you find in modern day Miami Beach or Naples. None of the buildings are more than three stories here and most of them aren’t right on the beach. Water temperatures are Caribbean-like from May through September and a thriving year-round local community keeps restaurant and bar prices in check. Come in September and you’ll find hotel prices ranging from $71 to $175. Located midway between New Orleans and Tallahassee, this set of barrier islands at the western edge of the Florida panhandle gets plenty of visitors from the Deep South. Hotel rates average $117 for the whole year and even in peak season the average doesn’t top $150. A three-mile taxi ride will cost you $10. If you love it so much you want to stay, note that on an apartment rental scale where New York City is 100, Pensacola comes in at 29.2 on Numbeo. Best known for casinos and frequent appearances on hurricane path maps, Biloxi is the heart of the “Redneck Riviera” of the Gulf of Mexico. This clientele determines the market rates and this may be the cheapest beach market in the USA: hotel rates range from $86 in November to only $114 in July. Nearby Norfolk is served by Southwest, so flights here are reasonable for those not coming from Virginia or DC. Hotel prices average $132 for the year according to Trivago, but plunge well below $100 in the winter months. Be advised though, when you get this far up the Atlantic then swimming is great in summer, too cold for many otherwise. Water temperatures only break 80F in August and are only above 70 June through September. As with Myrtle Beach below, check Groupon before you spend money on dining out or booze cruises: there are bargains every week. Budget airline Allegiant Air flies here from 14 markets and it’s less than a day’s drive from many southeast cities, so this is a very popular family travel destination. Myrtle Beach is also known for a hyper-competitive golf market, meaning green fees can dip below $40 a round with cart. Another bonus: you can find enough half-price attraction and event tickets on Groupon to last you for weeks. Hotel prices for the year average $132, but in October to February they range from $87-$112 double. Texans flood this island in the summer and rates skyrocket, but in the off-season those prices drop in half. When I did a search on Trivago for late September, I found 28 hotels going for less than $100 a night, including this one for $68. If you come in October it’ll still be hot, but you certainly won’t feel crowded: the island’s population is less than 2,500. There’s a big focus on value here and if you buy tickets to the Schlitterbahn water park online, you’ll get a souvenir soda cup with free refills. Houston is such a sprawling city that at 50 miles away, Galveston is practically a suburb. That makes the barrier island on the Gulf of Mexico a popular weekend getaway. You can rent a cabin in the state park that sleeps six for $175-$200, or camp there for $15-$25. Entrance to just park and swim is $5. Hotel rates average $143 throughout the year. The Galveston Island Historic Pleasure Pier is wallet-friendly for families. A $39.95 3-day pass allows unlimited rides. Sure, the best beach value of all may be to just find a quiet secluded stretch of sand where you can pitch a tent and pee in the dunes. But if you want some more comfort and places to take the family out to eat after a day of swimming and sunning, these are some of the best beach bargains in the USA. The wife and I do a biannual trip to Myrtle in Mid-September through early October. VRBO and Airbnb have a lot of listings; typical negotiated rates for one to three week stays can average USD 70 a night for a well-equipped one-bedroom oceanfront condo on a nice property. The beaches are sparsely populated, the water hovers around 80º F, restaurants are not crowded, etc. And there’s nothing like the Carolina beaches! The downside is that you won’t find much culture there, or, how should I say, a cosmopolitan population to mingle with. Agree with you on the timing Gary. Most people don’t realize the ocean water in the Carolinas is warmer in September and early October than it is in June. Really worth to read your blogs, I am the regular reader of your blog since last one year, I get inspired by reading your blogs and seeing all photos.